Remember when I gave you a peek inside my medicine cabinet? Nothing's changed… I'm still fighting illness with food! My most recent addition to our natural arsenal is homemade cough syrup — made with one of my favorite kitchen gadgets, the Instant Pot! I've got nothing against plain ol' raw honey as a natural cough remedy. I've given my family many a spoonful of it to ease a cough. It's powerful, and it works! Yet, for stubborn coughs or coughs that accompany colds, herbs and spices speed healing and bring relief more quickly. This is where my Instant Pot comes in handy. Using the Sauté feature, I can gently simmer herbs in water with a constant temperature. No more adjusting the stove and babysitting the pot! Which Herbs & Spices To Use For Instant Pot Cough Syrup? Fresh thyme is anti-inflammatory and disinfecting. 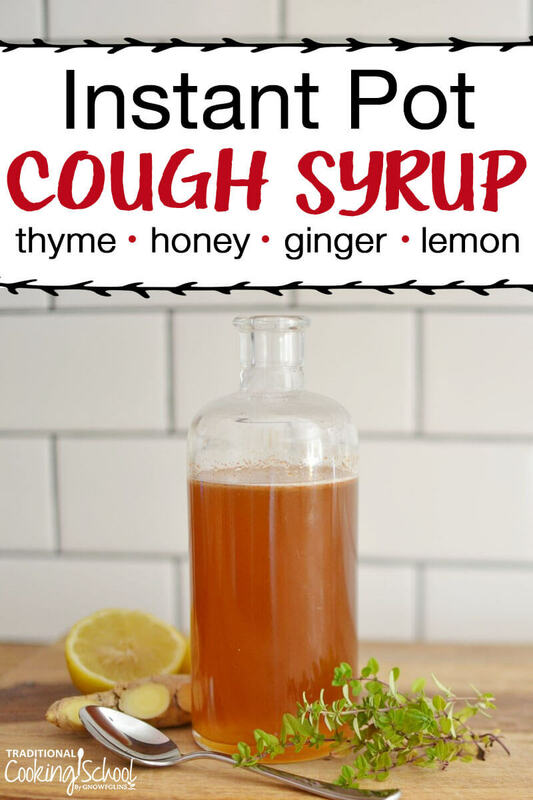 It's the perfect addition to homemade cough syrup, especially when the cough accompanies a cold. And you just can't find its lovely herbaceous flavor in any store-bought syrups. Similar to thyme, sage is also an anti-inflammatory and expectorant, with a long history of being added to old-fashioned cough syrup recipes! It has medicinal effects and is a powerful herbal remedy. In this recipe, use either thyme or sage. Both are unnecessary since their properties are very similar. Medicinal use of sage is contraindicated for pregnancy, so please use fresh thyme if you are pregnant. Ginger works as an expectorant to loosen and break up mucous in the lungs. Because of gingerol, the main bioactive compound in ginger, it possesses anti-inflammatory, anti-bacterial, and immune-boosting properties. Exactly what we need to fight illness and stop persistent coughing! Cayenne contains a compound called capsaicin. Capsaicin “relieves the pain by suppressing a chemical that carries the pain message from nerves in the affected area to the brain” (source). This is especially relieving if coughing causes or worsens a sore throat. Cayenne is very spicy, so you may want to leave out or reduce this ingredient if you plan to administer your homemade cough syrup to children or sensitive adults. Finally, lemon is anti-bacterial, helps boost the immune system, and can open up the sinuses. I've even used it alongside raw garlic to treat strep throat! Now that you know a little bit about the ingredients, let's make cough syrup in the Instant Pot! My most recent addition to our natural arsenal is homemade cough syrup -- made with one of my favorite kitchen gadgets, the Instant Pot! Put water, thyme, and chopped ginger into the Instant Pot. Simmer the herbs in water until reduced by half. 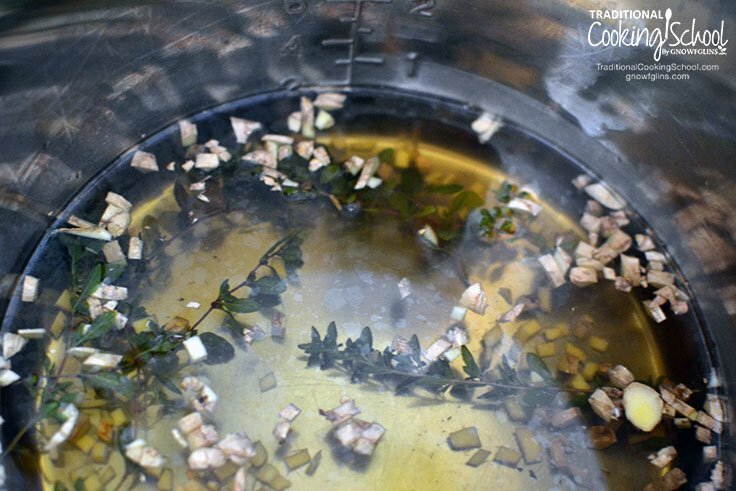 Allow to cool until the temperature is warm, not hot, steeping the herbs the entire time. Discard or compost the thyme and ginger. Return the thyme-ginger tea to the Instant Pot. Whisk in honey, lemon juice, and cayenne pepper, if using. Transfer to an airtight jar or bottle. Syrup will keep in a dark cupboard for 1 week. After that, it should be stored in the refrigerator. Administer a tablespoon as often as necessary to soothe a sore throat and calm a cough. 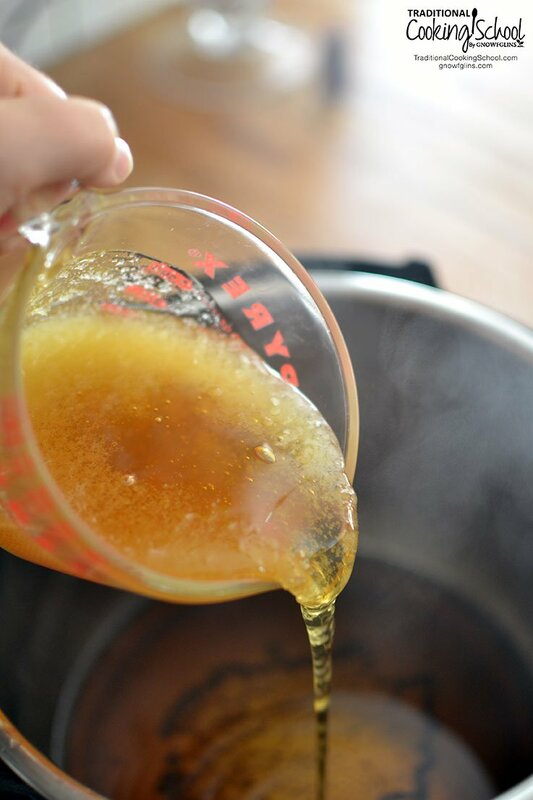 Have you ever thought to make cough syrup in the Instant Pot? 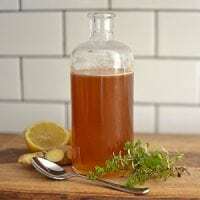 Have you ever tried homemade cough syrup? You simmer the herbs in water until it’s reduced by half, then strain. Make sure to cool the “tea” before adding the honey so as not to destroy the benefits of raw honey. Mine was ready for honey in about 15 minutes. Why is the liquid returned to the Instant Pot in Step 7 if the Instant Pit is not turned on again? I just got my Instant Pot last week – so excited! Just wanted to clarify the instructions…you are using the saute function with the lid off? And when you add the honey….you are just re-using the pot as a mixing bowl? Not cooking again, right? Keeping the honey raw to maintain all its beneficial properties…. Thanks for this recipe! It looks doable and we have colds right now. Yes, Nikki, the lid is off. Add the strained “tea” back to the pot and then add honey to the warm tea, but don’t turn the heat on so as to keep the honey raw. That’s right! Why use the instant pot at all since your not pressure cooking? Seems like it could be just done in a pot on the stove. We just moved to Nepal, and I have a pressure cooker (pot) and a gas range. I’ve never used an Instant Pot and am only just learning how to use my pressure cooker. Wondering if there is a relatively simple way to adjust the directions? Thanks for this recipe! You could make it on the stove in a stainless steel pot, if you have one. Follow the directions by simmering the herbs in water until reduced by half. Remove from heat, let cool, strain, add honey. It would work! super, thanks so much! Half my family has come down with a headcold that has lead to the “Kathmandu Cough” so I’ll be making up a batch of this tomorrow! Hi! I wonder what is an instant pot? I was wondering if you know how long this will keep in the refrigerator? Winter is almost here in Wisconsin, so I won’t have access to my fresh thyme much longer. If I make up some batches, I’m wondering if it would keep through the winter/spring? Honey never spoils, but with the other ingredients, it probably does. Do you have any thoughts on that? I would say it could safely last for a month, maybe longer. Just go by taste and smell. If it tastes or smells off, it’s probably off. And of course, if it begins growing mold, you know it’s time to toss it. Why not store in the freezer? Then take it out as you need it. Where can I find out more information about the instant pot and about how and where to purchase one? Thank you so much! Made this last night…breastfeeding and have a terrible cough. How long will it keep in the fridge? I have an Elite Platinum Programmable 8-qt electric pressure cooker.. how is the “Instant Pot” different? Thanks for sharing. What to give this a try. I made this today, and it is very runny. Is that supposed to be the consistency? It’s definitely not thick like store-bought cough syrup. Mine thickened up a bit once it chilled in the fridge. The benefits are not found in the consistency, but in the ingredients. Hope that helps! Hello Lindsey! I know this post is over two years old, however, I had to compliment you on this recipe. I made it for my sick children(croup). I had the same question about consistency so your reply cleared that up. I did use the stovetop method. In addition to your recipe(well minus cayenne), I added the peel from the lemon in pot while it was cooling. The taste was splendid straight off the spoon! Thank you for this lovely recipe! Hello, I am so interested in getting this instant pot a try. Do you store your cough syrup in the jar in the pic? Where did you get the jar? I absolutely love it. Can you use dried thyme? I have a ton of dried sprigs that I harvested from my garden this year. Yes, I believe dried sprigs would also work! How do you simmer with the Instant Pot? Simmering is to stay just below the boiling point while being heated. If I use sauté it comes to a rolling boil. Am I doing something wrong and need to press a different button? I use the Saute feature, Dee. It only needs 5 minutes of simmering (medium-small bubbles rising to the top), so you shouldn’t be at a total rolling boil yet. Are you covering it w/ the pressure sealing lid or glass lid? Perhaps it’s holding in too much heat, causing the temperature to come to boiling sooner? I guess I just don’t understand why you’d go to all the trouble to use the instant pot when it would be simpler to just make this on the stove. Am I missing something? The point of this recipe, Angela, is to show the Instant Pot’s versatility. If you prefer to make the syrup on your stovetop, that’s totally fine! Is the Instant Pot and Electric Pressure Cooker the same thing? The Instant Pot is a specific brand of electric pressure cooker. There are other brands, though the IP is the one we at TCS use! Hope that helps! So sick this week! Just made a batch of this to help with my cough. We’ve been sick all week too! Feel better! I hope the cough syrup helps! I wanted to share how I’ve been using this over the past few days. I was taking a TBSP at a time but I grew tired of going back to the refrigerator every 20 or 30 minutes. So I poured about 1/4 cup in a small bowl (a cup would work) and I sip it over the course of 5 or so minutes. Almost like a tea. This has been especially helpful when a “fit” of coughing comes up. That’s awesome, Danielle! I hope you’re feeling better! I made this with a normal pan not a pressure cooker and its more liquid not like syrup but i think the benefits stays the same . This sounds like an excellent cough recipe! Thanks for making it available in PDF form for keeping! Just curious if there is a dosage suitable for toddlers? I don’t want to destroy all the medicinal properties in raw honey that can easily be destroyed at high temperatures, such as 120 degrees Fahrenheit. Do you know if there is an option with the instant pot to cook at a temperature under 120 for several hours so that I can infuse my honey? I know that there is a yogurt option on the instant pot that cooks below 100 degrees Fahrenheit, but I have no idea if that option would work with my honey. Turn off the IP and let cool for 5 min. Stir in honey, etc. It will infuse slowly while in cupboard for a week. Or heat very low an hr to infuse for present illness. If I don’t have the dried ginger powder can I use fresh ginger? If so how much would I use? Thanks! I have a few questions that were asked but weren’t answered yet. Can we use fresh ginger instead of dried. If so, how much? Also, what dose do you recommend for a one year old? Thank you! Why keep in dark cupboard for a week? What if you dont have Instant pot ??? How do you make it ? Would this be worth making with dried herbs? Is it ground (dried) ginger or fresh ginger, finely chopped?